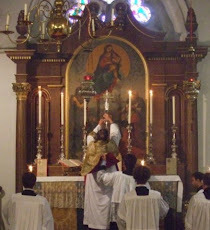 Fr Hunwicke's Mutual Enrichment: Fr Faber, of course. God bless him. If, like me, there are NO suitable priests for private spiritual direction in your area, I recommend going to Father Faber. His book "Growth in Holiness" is really a book of spiritual direction that fits almost anyone who wants to do just that - grow in holiness, without a personal director. Good directors are difficult to find - not to say priests who are busy in a parish are unsuitable - not at all…just that direction is a gift not all priests have. Another recommendation, if I may Father, is "Self-knowledge and Self-dicipline" by that wonderful priest B. W. Maturin. This gem was written in the early 1900s and like Father Faber's books is timeless.